Colonel David R. Hines, sheriff, delivered an address to the graduates, as well as presented them with their certificates and awards. Eight of the graduates will enter into their final phase of their training as patrol deputies where they will spend at least 12 weeks with a field training officer. 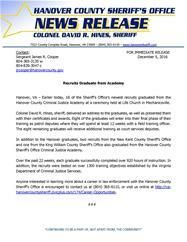 The eight remaining graduates will receive additional training as court services deputies. In addition to the Hanover graduates, two recruits from the New Kent County Sheriff’s Office and one from the King William County Sheriff’s Office also graduated from the Hanover County Sheriff’s Office Criminal Justice Academy.